All we know Android phone occupied a big mobile market around the world. There are lot of features on our Android phone. Today we have to discuss how to use facelock feature on Android Lollipop. It is an interesting and latest facelock feature for your Android Lollipop. All we know security is most important part of our Android phone. Lot of time different person either our family members or our close friends unlock your phone and view your confidential or important documents, images, video etc. There are different ways to lock your Android phone either you have to apply swipe, pin or pattern password as per your need. Most of the time some other person unlock your Android phone. The main reason they will see close eyes on your phone during draw pattern password or typing pin password in your Android phone. When your phone is unlocked your important data will not be safe with others. Due to which we need a strong locking feature to keep safe of our important data, videos, images and other things. Now with the help of this article you will be able to apply latest facelock locking password on your Android phone. After applying this password nobody able to unlock your Android phone. When you want to unlock your Android phone, you just put your device in-front of your face, Your phone will be unlocked as soon as it recognizes your face. If your doesn’t recognize your face, then you have to fill the pin or draw pattern password to unlock your Android phone. During adding a trusted face on any Android phone, you have to keep few important things, first you have to hold the phone at your eye level and also check the level of light. Always remember the light is not too much bright or dim. 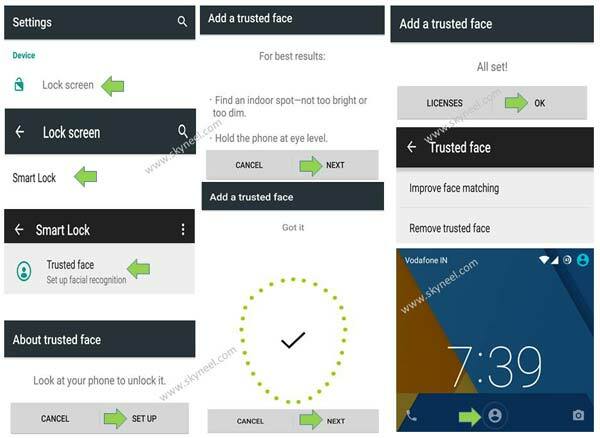 If you want to apply facelock feature on Android Lollipop then you have to take few simple steps on your device. Step 1: Tap on the “Settings” option. Step 2: Tap on the “Lock screen” option, which is shown in “Device” category. Step 3: Tap on the “Smart Lock” option. Step 4: Fill the password for confirmation and tap on the Next button. Step 5: Tap on the “GOT IT” button in “Smart Lock” screen. Step 6: Tap on the “Trusted face” option. This option helps you to unlock your device when your face is recognized. Step 7: After reading the information about trusted face, tap on the “SET UP” button. Tap on the “NEXT” button. Hold-on your Android device in-front of your face after few second it automatically add your trusted face. Now, tap on the “Next” button. Finally tap on the “OK” option. Now close all opened windows and lock your phone by pressing power button, next time if someone try to unlock your phone then he need either password or trusted face. If you want to unlock your phone then hold-on your phone in-front of your face now, you will see an unlock icon is shown on your Android device. There is no need to type the password or draw pattern password to unlock your phone. Note: If you want to remove facelock feature from your Android device then you have to tap on “Remove trusted face” option in Settings > Lock screen > Smart Lock > Trusted face window. I hope after reading how to use facelock features on Android Lollipop article, you will be able to keep safe your phone data. You can also share your knowledge with others and also write your important suggestions regarding this article in the comment box. Thanks to all.